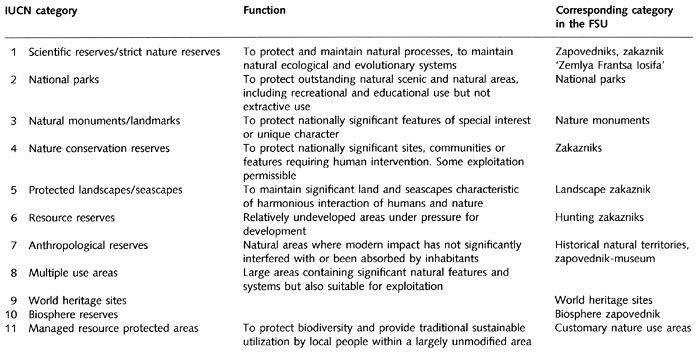 There are different categories of protected areas with a diversity of designations: zapovednik, zakaznik, national park, nature monuments, and customary nature use areas (Table 24.1). At the end of 1997, the Russian system of protected areas included 95 zapovedniks, 32 national parks, over 1600 state zakazniks, and about 8000 nature monuments including 29 monuments of national importance. See descriptions and images of Russian Zapovedniks and National parks in a special section of our site. State zapovedniks are the strictest territorial form of nature protection (Table 24.1). Zapovedniks are areas permanently withdrawn from economic use. They also include academic research facilities for investigation of ecology, conservation, and monitoring of landscape and biological diversity. Academic orientation is a distinguishing feature of zapovedniks, which makes them superior to nature reserves in many other countries. Traditionally, research stations owned by universities and national Academies of Science, are attached to zapovedniks. Continuous observation of protected populations and research on the dynamics of vegetation communities are carried out, thus creating a unique network of research sites with 30-60 year-long data records on ecosystems and biota. The first nature reserve, Askanya Nova, was established in the Ukraine in 1874. The history of Russian zapovedniks dates back to 1916 when Barguzinsky zapovednik was established near Lake Baikal to protect sable and Kedrovaya Pad zapovednik was set up in the southern Far East to conserve the rich biodiversity of the Far Eastern forests. Since then, the development of the zapovednik system has been following the physical geographical and biogeographical principle that every bio-geographical region should have a zapovednik (Tishkov, 1991, 1993, 1995; Shtilmark, 1996). Although successful, the history of zapovedniks in the FSU is not trouble-free. For two decades, between the late 1930s and 1950s, conservation areas were considered by many Soviet officials as the alienation of land which otherwise could be used for industrial and agricultural development. Nature was treated as a resource that should be exploited and therefore conservation was viewed as an obstacle to the established economic priorities. In 1951, at a peak of the anti-preservation campaign, the number of zapovedniks was reduced by 70 per cent and their area by 80 per cent (Pryde, 1991). Restoration of the system began in the late 1950s, following Stalin's death and a relative democratization of the Soviet regime, but not until the mid-1980s was the area previously occupied by nature reserves again achieved. In most countries of the FSU, zapovedniks remain the main territorial form of conservation, although Belarus, the Ukraine, and Baltic states now focus on the creation of national and natural parks. The break-up of the Soviet Union, economic transformation, decentralization of power and, in some regions, deteriorating socio-economic conditions have put many zapovedniks (and other protected areas) under pressure. Poaching and grazing on protected lands and attempts to use them for development have become common. However, so far in Russia, Belarus, the Ukraine and Baltic states not a single zapovednik has been closed. Moreover, six new zapovedniks were established in Russia between 1994 and 1997 (Table 24.2). Zapovednik territories vary widely from 2-3 km2 (Galichia Gora in Russia and Ukrainian Steppe in the Ukraine) to 40 000 km2 in remote areas, mainly of northern Asia (Figures 24.1 and 24.2). Depending on location and size, zapovedniks conserve between 300 and 1500 vascular plant species which constitute between 30 per cent and 80 per cent of regional floras. 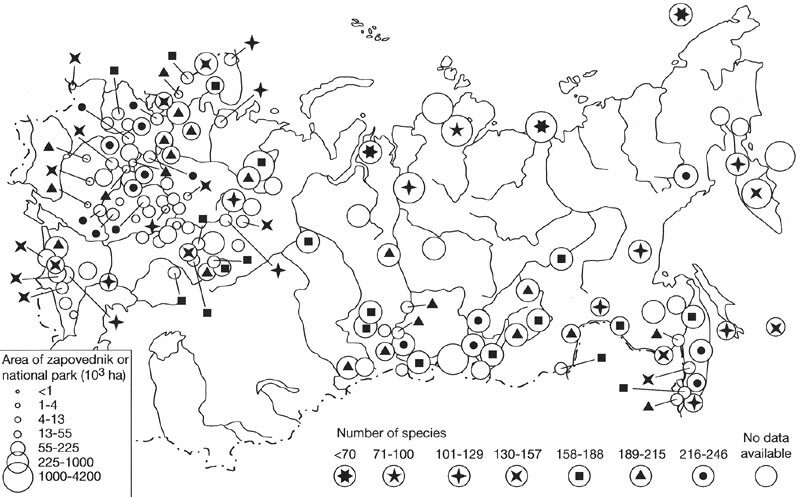 Locations and boundaries of zapovedniks are selected to combine area, representativeness, and hot spots defined by species-richness, endemism, or distinctiveness. Recently, a 'catchment' principle has been adopted in designing zapovedniks. According to this principle, a protected area includes the catchment of a stream, river or lake draining the area. This creates a buffer zone and protects an ecosystem and biota designated for protection from external impact. At the end of 1997, there were about 300 zapovedniks in the FSU. Russia accommodates 95 of those, employing over 5000 full-time personnel, mainly academic staff, and guards. In Russia, zapovedniks occupy a vast area of over 310 000 km2 with the terrestrial zapovedniks accounting for approximately 262 000 km2 (State Report, 1997). Although impressive, this system contains gaps. In Russia, zapovedniks cover only a modest 1.5 per cent of the total territory. The distribution of zapovedniks and land covered across the FSU is uneven. For example, in northern Taymyr, zapovedniks occupy 10 per cent of the total area, while in some steppe regions, which contain high biodiversity threatened by overdevelopment, only 0.1 per cent of the territory is covered. 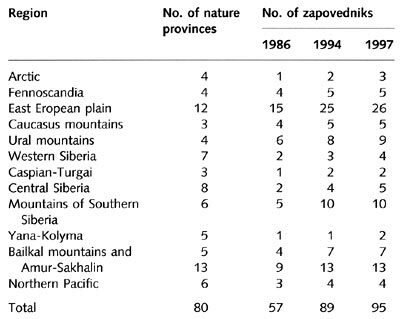 Tishkov (1995) evaluated the regional coverage with respect to zapovedniks in Russia and concluded that many areas, especially in the biomes of polar deserts, forest-tundra, larch open forests, steppes, and semi-deserts are under-represented (Figures 24.1 and 24.2; Table 24.2). National parks play an important role in the conservation of biodiversity, protection of sites of high aesthetic or historical value, and are intended for recreation (Table 24.1 above). Because national parks have a conservation function, crucial to their performance is a zone with a strict conservation regime. Such zones occupy between 7 per cent and 44 per cent of the total park territory (National Parks of Russia, 1997). Although the first suggestions to create national parks in Northern Eurasia date back to the beginning of the 20th century, further conservation efforts focused on zapovedniks and it was not until the 1970s that the first national parks were established in Estonia (Lakheemaasky) and Latvia (Gauya). The first Russian national parks, Losiny Ostrov within the Moscow urban area and Sochinsky on the Black Sea coast, were founded in 1983. Currently, there are 32 national parks in Russia with a total area of 66 500 km2 (0.4 per cent of the country's territory). The parks vary in size from 66 km2 (Kurshskaya Kosa in the Kaliningrad region) to 19 000 km2 (Yugyd Va in the Komi Republic). National parks complement conservation work carried out in zapovedniks. For example, there are no zapovedniks on the Russian coast of the Black Sea and the conservation functions fall with the Sochinsky national park which preserves habitats of European tortoise and also more than thirty plant species listed in the Red Data Book (1988). The Valday national park protects the only large forest massif between the two largest Russian cities, Moscow and St. Petersburg, which harbours large game, mainly brown bears. Zakazniks are areas withdrawn for either permanent or temporary protection. This form of nature protection usually corresponds to category 4 of the IUCN classification (Table 24.1), although some zakazniks do not meet the category 4 criteria and should be attributed to categories 6 or 7. On the other hand, the largest zakaznik, Zemlia Frantsa losifa which was founded in 1994 on Franz Josef Land and occupies 42 000 km2, is regarded as a category 1 protected area. Zakazniks are aimed at protecting one or many components of the natural environment. Their status can be national, republican, regional or local. The key function of zakazniks is animal and game conservation, and breeding and often they integrate conservation with hunting. Zakazniks also protect rare species including 21 mammal and 68 bird species listed in the Red Data Book (1988). At the end of 1997, there were more than 1600 zakazniks in Russia with a total area of more than 600 000 km2 (State Report, 1997). Among those, 66 are of national importance. Another 19 zakazniks conserve wetlands of international significance under the 1971 Ramsar Convention. Nature monuments are relatively small territories or individual nature objects which are conserved without land withdrawal by the decision of local authorities. Unique geological outcrops, habitats of rare plants or animals, a wood, a lake or an ancient tree can be given the status of a nature monument. This form of protection was initiated in the 1960s and proved an efficient and flexible way to realize local initiatives for small-scale conservation. It is especially popular in the regions where non-governmental organizations are actively involved in conservation. For example, in the Komi Republic there are about 500 nature monuments. However, in those regions where environmental awareness of the public and local authorities is not strong, nature monuments come under particular pressure. 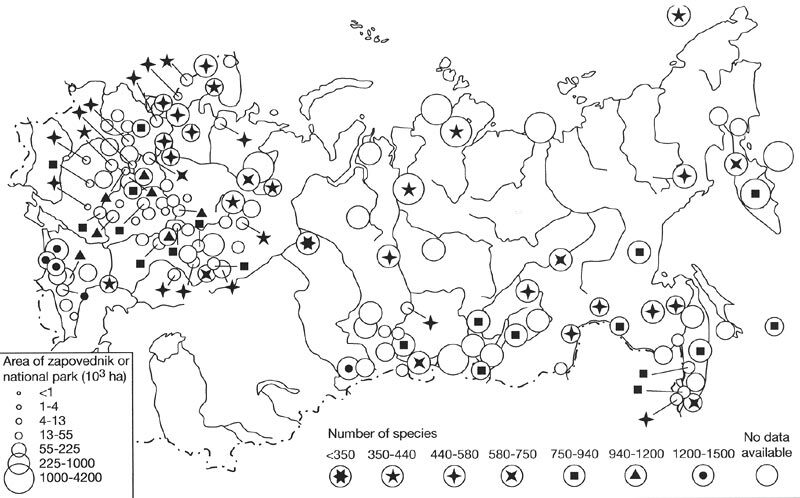 At the end of 1997, there were about 8000 nature monuments in Russia. Of these 29 are of national importance and mainly protect small woodlands. Customary nature use areas are a comparatively new form of nature protection in the regions of residence of indigenous communities in the Russian north, Siberia, and the Far East. They are created by the decision of local authorities and have been established in the Khabarovsk region, on the Yamal and Taymyr peninsulas. The development of these areas is limited so that indigenous peoples can maintain their traditional occupations such as hunting, fishing, and trapping. This form of nature protection does not create the conflict that often exists between conservation (i.e., ban on hunting and fishing in nature reserves) and traditional economies.